Hello everyone! I wanted to do a giveaway in appreciation for those that take time out of their busy lives to read my blog. The encouragement and support I have received has been overwhelming. Thank you from the bottom of my heart! Anytime I do a post with photos of my demijohns (wine bottles) I always get a lot of comments. Below are some pictures of my collection. Since so many of you seem to like these I will be giving the demijohn below from my own collection to the lucky winner. Also included are the adorable patchwork pumpkin and gourd I purchased at the Fall Festival. Sorry tray and sign not included. 2. Let me know you are a follower for an additional entry. 3. Blog or post the giveaway in your sidebar for another entry . Please leave a separate comment for each entry. The giveaway is open worldwide and also for those that do not have a blog. Please leave your email address if it is not in your profile or on your blog. The giveaway will end at midnight 10/3/10 and the winner will be selected by random generator. What a wonderful blog site! Enjoy all your updates and beautiful fall decor. Great giveaway and I sure would like to win! What a great giveaway. Love your blog and would love to win! 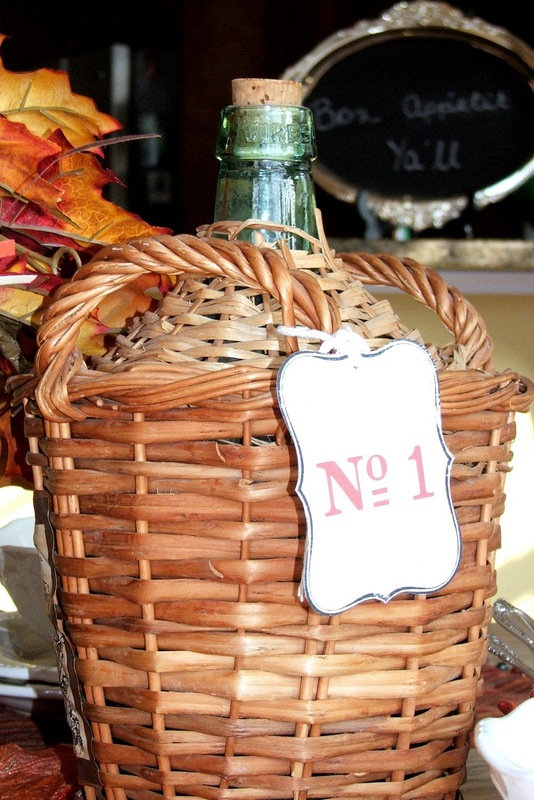 Oh My goodness I hope I win this give-away I love your wine bottles-My favorite display is the one of several bottles in a basket with a quilted covering peeking over the top of the basket -so pretty –The pumpkins are cute too. I would love to enter and win your giveaway. Such pretty items! Thank you for the opportunity to win! I am also a follower of your lovely blog. What a lovely giveaway, thanks so much! I love your blog. Hi Sherry! Of Course I will leave a comment! What a lovely giveaway from such a lovely and astute decorator! And, again, you KNOW I follow! Okay,,I've already left hugs and love, and the "Bus" so how about, Wishing you the happiest Fall and Blessings to YOU and yours! Okay GF,,,,,,last one! You KNOW I follow,,,,and I WILL post on my Sidebar about you and your wonderful Giveaway! That's 3! So glad to count YOU as a dear blog friend! Okay, more hugs, Love and another "Bus!" What a wonderful giveaway! I would love to win. It would look great in my Country French home! Thank you for the chance to win! I am also a follower! I really enjoy reading your blog. And I have just added your giveaway to a link on my side bar…. I REALLY like the name of your blog! That is just perfect!!! The wine bottles are really cool! Very nice indeed! Those wine bottle are fabulous! They would look perfect in my home. Demijohn! I would offer to BUY one of those stunning vessels! My daughter has a blog, Henrietta's House that I can't wait to check on Wed. nights. Their entire household is sick, even Daisy, their dog. So, I had all this time to check out the other lovely settings and happened upon yours. Demijohns, mmmm, I've always wanted to collect something. And since I love wine, this may be perfect for me. I'll begin my hunt tomorrow. 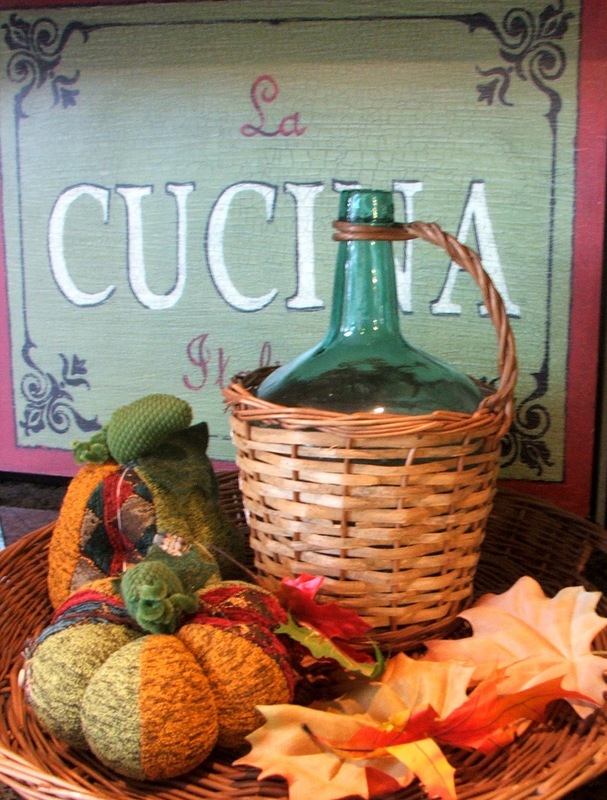 What a great giveaway…love the patchwork pumpkin and demijohn!!! Thanks for the chance to win. What a sweet giveaway! Thanks for the chance to win some great things! Gorgeous table, Sherry…so much eye candy! Love all these ideas! I love your table with the fabulous centerpiece. 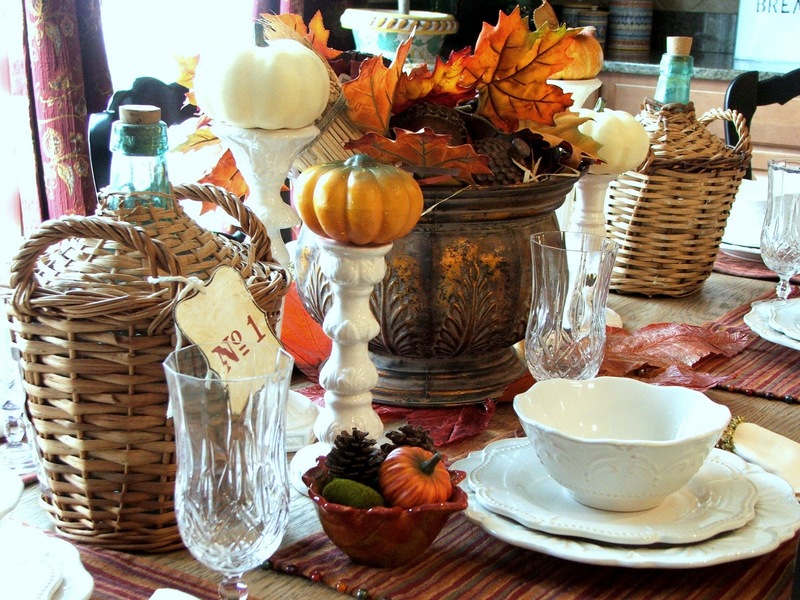 Come link up to centerpiece Wednesday and share your creative ideas with us. How ironic I just saw some of these today, but they were too expensive I thought..not sure of their pricing, I do know they are not cheap. This is a lovely giveaway and I would love to be entered. Now this is my kind of GIVEAWAY…love it!!! I'm posting your awesome giveaway on my sidebar! I love your pictures! Such a beautiful display too. Thanks for the chance Miss Sherry-berry! And of course I am a decor loving sheep….I follow. What a Special & Wonderful giveaway….Thank you so much!! I love reading your blog and looking at your beautiful home & store. Will your style and incredible design sense come with those items through osmosis? 🙂 Anything that came from your personal collection would feel like a prize to me! You are so kind to allow your overseas friends join in with this amazing give away-thank you so much! I would love to be included if I may! Sherry I would just jump with joy to win this gorgeous demijohn! Wow this is a very generous giveaway! I have been a follower of you blog for a long time now! Sherry I just posted this on my sidebar! Thanks again for the chance! I'm a follower too. Love the old glass. It's expensive now, so a giveaway is great! Lovely giveaway! I actually found bottoms of demijohns in the York River back when they were attempting to do some excavation of Cornwallis's ship. It would have been beyond belief to have been able to find a bottle intact but it was still so exciting to hold pieces of history in my hands! Ohhh, I would love that demijohn! Count me in. What a lovely thing to do! And because it is yours, makes it more special. I am a daily follower! these wine bottles are a great collection is something that around here (pa) when i visit flea mkts or auctions that i never see, so maybe if i win i can start another collection as my hubby would say! You are so very genorous! I follow your blog and love it! Thank you for sharing your world of inspiration with us. Great table and a fantastic give away. I am a new follower and will post your giveaway on my sidebar. Love those! Thanks so much for the giveaway!! I have just started buying those demijohns. I bought my first one on ebay. I like the texture of them! What a great giveaway! I have been following you for a while now! I just added your giveaway to the top of my sidebar!!! I hope I win!! Sherry – I love your photos, and the way you have styled the shots, almost as much as the demijohns themselves. 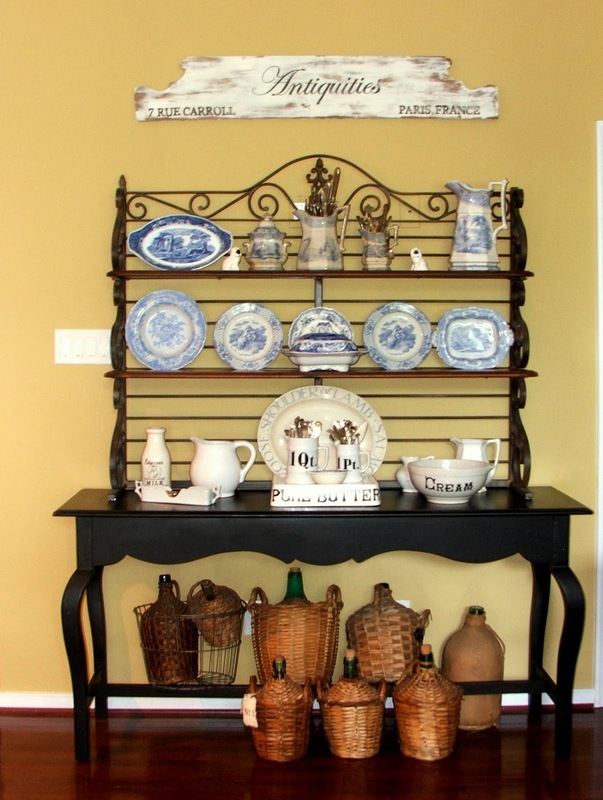 You have a wonderful eye for arranging everyday items to look so inviting! I would love to win the demijohn. When cleaning out mama's house last fall, I found one which now is displayed on top of my refrigerator….it's so lonely up there so I really need this one! I'm am a follower of your lovely blog too! I would love to enter your giveaway! Those bottles are amazing! Love them and thank you! I am a new follower as well and can't wait to read more of your lovely posts. Thanks again! I would love the wine bottle and pumpkins. So cute! I really like how you have them all displayed in the basket, such a good idea! Love your wine bottles and am appreciative of such a generous giveway. Boy do I hope I win! Oh and I'm also a follower! I enjoy your reading your blog. I am a follower as well! Love your blog! I love demijohns. I have collected a few of them and made one of them into a lamp. You have a fabulous collection! 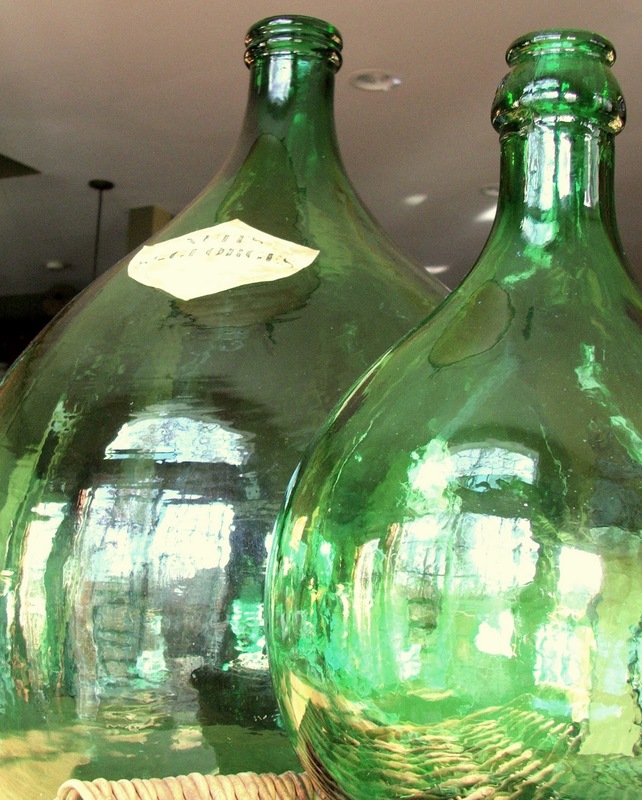 Sherry….love your wine bottles, and would love to be included in your giveaway!! Have a great VTT! I have admired your demi-Johns for a while.. even thought of trying to make one myself… BUT to win one of yours would be fabulous. Oh I love this! How exciting and very generous. Oh and I'm a follower! ohmygosh, I love these wicker wrapped bottles, but I'd never heard their name, "demijohns", COOL, I have some too that my husband bought and I stole them from him, te he. Glad you'll be linking up to VIF!! What a lovely blend of items in your display. Beautiful! Hi Sherry! You know I love your blog and love what you post! Please enter me in your most generous giveaway!! I am enjoying your blog so much. Your collection is impressive! If I win, I will start one of my own. Thank you. Love that bottle and the cute little pumpkin! I'm a follower too! I canot drink wine anymore due to medication I take. I love a good glass tho. You have some very interesting bottles. I do love your style and your collection. My husband and I travel and visit wineries along the way. Hope I'm lucky! And I have been following for some time. Love your blog. I think the demijohn is cute . I need to thank you for introducing me to demijohns! I need something new to drool over and this is it! Show a picture of them in every post please just so I can get my fix! Of course I'm a follower! Where else would I get my inspiration? Giving you a shout out on my sidebar! Come see! Oh, you are to sweet! I would love to win this giveaway. I do not have a demijohn and would love one! Please enter me! I am already a follower so please enter me again! Thank you!!! I am surely going to add this wonderful giveaway to my sidebar for one more chance, so please enter me again. LOL! Love it! Thanks so much! Your going to make someone very happy! Sherry, I love your blog!! I am a follower! I would feel cherished to win your give away!! Oh my from your own collection? How sweet!! You are soo generous my sweet friend. I'm a follower from waay back and I'm off to post about this on my sidebar. Love those! Count me in. Another follower I am. I love the wine bottles. Share with us sometime as to how and where you have collected them. those pumpkins are adorable. I enjoy your posts! Just became a follower (and I will follow) not just for the extra chance! Very cool collection, I love old bottles, but I only have a few myself. Happy VTT. Hi Sherry, love your wine bottles, they a great touch for decor! This is very neat…Would look great in my kitchen! It would be fun to win, but I see the odds are not in my favor. Anyway, I thought I already was a Follower, but I see I wasn't – so now I am! Your table is gorgeous!!! Beautiful Giveaway! I would love to win your demijohn, thank you for sharing. I'm a follower. Great giveaway count me in! Thank you for this giveaway. I am a new blogger and ran across your site. I am a wine drinker and I would love to have this bottle. Happy Fall.! The wicker part is cool but for me the attraction is the wonderful green color and pot bellied form. What a beautiful blog! So many great ideas! I too love to decorate for every season and have a tree decorated for each month! Your bottle collection is so lovely. I would love to start one too! Wow, what a great giveaway. Thanks for the chance to win! Love your demijohns, but I also love them without the wicker. Count me in! I'm a regular follower! Hi Sherry! Just came over from Penny's blog! Love your blog & love those bottles! & the wicker! I do not have a blog so I will leave my e-mail! Thanks so much for a lovely giveaway! And I am now a follower! So glad I am! How very sweet of you to do a giveaway for us, my friend! Ohhh yes, I always enjoy seeing your fabulous demijohns in your vignettes, tables, and decor! Hmmm…I have never had one and would just adore it! I also think the little patchwork pumpkin and gourd are just adorable! I could certainly give them a good home! Hehe! I am thrilled at the chance to win! I have also been a very delighful follower of your beautiful blog for quite some time now! I have enjoyed each and every post, Sherry! Thank you sooo much!!! what a lovely giveaway – love the demijohn bottle. You have a wonderful blog! I love the giveaway! how generous. I am your newest follower….I definitely agree with the sentiment..No minimalist here either!! What a fabulous giveaway, love the demijohn to bits! Thank you for the chance. OH WOW<Please count me in! This would be just the fall pieces for my kitchen!I need them.OH BOY!!! THanks for this chance,crossing fingers NOW! I love your blog and I am a follower. Please enter me in your giveaway. Thank you. Whew I almost missed this great giveaway!! I would love these to brighten up my older fall things!!! Love your demijohn collection and would love to win one of my own. Love the colors! Please enter me. Signed up as a follower! Oh my gosh, that pumpkin is SO sweet and I love the demijohn, too. Thanks so much for your sweet words on my DIY Crystal Wirelier, Sherry. Sheesh, just sliding in! You know I'm already a follower. Pick me! Count me in, too. I'm no minimalist either!